This is kind of a followup to a post I made about the difference between Netbook and Regular edition of NIS. I have a newly bought netbook that I haven't set up yet. Bought the netbook edition of NIS at a local office supply retailer. It appears to be the 2009 edition(NIS NE 2009 EN), has the usb drive key etc,box says 1 year protection for one pc. My question is what would be the best way to install this so I have the most current version. Currently my plan is to uninstall the Mcafee trial protection that comes with the netbook,using the Mcafee removal tool,then download the trial version of NIS 2010 netbook edition from Norton's website and use the activation code from the box edition that I bought to validate for one year of protection. Is this the best way to do it or is some other way suggested? Yes, that's the best way to get the latest version. Uninstall Mcafee, download and install the latest version of Netbook edition, and then activate it using the Product Key from the CD sleeve. To remove Mcafee completely from your computer, you may need to use the Mcafee Removal tool. Check the instructions provided in the McAfee Support Article in this LINK. Let us know if you face any problems with installation. Thanks Yogesh,I will unbox the netbook and set it up in a week or so,too much going on right now with the holidays. BTW there is no CD sleeve,product key is on a card in the box. I'm assuming I can wait till near the end of the trial period and then activate with the key, will this give me one year of coverage plus the lenght of the trial period? Yes that is correct on the trial and then activation. That's interesting that the KEY says it is for 1 PC since the 2010 version as shown on the website here says it is for 3 netbooks. I queried that with Symantec since not many people have 3 netbooks, even in one "household" but don't have an answer -- I did try a valid netbook KEY on the standard version of NIS and it won't activate it -- since it would make more sense if the KEY was interchangeable between netbook and standard versions of NIS. Then one could do a desktop, laptop and netbook all on one licence. However I found that the netbook version seemed to run OK on my desktop which is where I was trying it out. I have the 2009 box edition,it clearly states one year,one pc -cost was 20 dollars. I notice that the 2010 netbook edition covers 3 computers but also costs more (70 dollars),which is 10 dollars more than the regular version of NIS 2010!!! Thanks for the replies everyone,I will post back in a couple weeks after I get time to set it up. Thanks for the link to the NE edition. I didn't have that one on file. Is the trial version the same as the latest and full version link above? If it is I was planning on downloading the trial version and then at the end of the free period activating it with the product key I have from the box set,assuming that I would get a full year from the end of the trial period. When activating with the product key does it deduct the length of time you had it for the trial period? For example when activated does the one year coverage start from when you loaded the trial version or start on the date you actually activated it? I'm just trying to get as many days as I can. yes, they are the same. you will actually have a trial version on the full version before you activate it. i think they're the exact same file anway, and that you just get it a different way when you use yasos link. I've not downloaded from the link Yaso gave but those usually are updated to the latest engine version fairly quickly after they get issued as Live Updates -- nothing is simultaneous -- and it's a while back since I downloaded the copy I tried out. I would say it is more likely to be fully version uptodate than the trial version but I can't be sure. 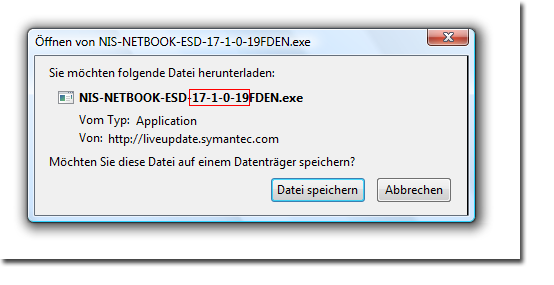 PS I just checked Yaso's link and the file name is: NIS-NETBOOK-ESD-17-1-0-19FDEN.exe so it is the latest engine version but of course it will need liveupdate run to get the definitions etc updated. Ok I downloaded from the link Yaso provided (not the trial version) , I uninstalled McAfee first,used the tool afterwards then installed NIS 2010 netbook,it is giving me a 15 day trial period,when it gets near the end of that I will use the registration key. So far,so good. Funny thing is NIS seems to use about the same if not slightly more system resources as McAfee,I was expecting it to use significantly less,although I didn't really enable McAfee or update definitons,I'm assuming it was already enabled with default settings by Acer on the preload. I'll post back SOLVED on this thread after I activate with the key in 2 weeks. Thanks for the help everybody!! "The tool" being the McAfee tool to remove all traces of it? If not then that might account for some "loading" with apparently only Norton there. Yes,the McAfee removal tool. Rebooted after uninstalling from Control Panel and rebooted again after using the tool. Commit charge in Windows Task Manager window was appox 410 MB with original McAfee install and about 323 MB after uninstall. The commit charge with NIS installed is around 425,about 10 or 15 MB higher,but not a big deal really,doesn't seem sluggish or anything. I don't know if this is valid but I get the impression that a system with NIS newly installed is a bit slower until NIS has really done a full system check and has got the Insight uptodate. If you haven't try a forced Insight update under Application Ratings on the main screen and force a Full System Scan. Went to validate the trial version with the activation key from the box set last night and ran into problems. Error message came up stating it was invalid,already in use. Connected to online support chat,the tech said I was using a key from a regular version of NIS and that is why it was not working. She wanted me to go back to Staples where I bought it and have them resolve the problem!!! I advised her that it was a Norton problem not the retailers problem and could she supply me with a valid key. The tech spoke with her supervisor,told me they have limited support capabilities for Netbook edition in chat and she could not provide me with a key. This went on for an hour. After the call ended I inserted the usb key and it seemed that a regular version of NIS 2009 was loaded on it,not the netbook edition. Looking closer at the card that came in the box,the printed part of the card referred to Netbook edition but the part with the activation code was a large sticker,under the product key and barcode it said "Norton Internet Security 2009 1 - User. I then called the phone number for tech support and used the case number I had from the chat session.There was almost no wait time and when I explained the problem to the tech he accesed my netbook remotely and entered a different product key which worked,plus he gave me an additional 30 days coverage due to the problems.The whole phone session took less than 10 minutes!! My guess is somehow the box had code for regular edition and not netbook edition. After checking my Norton account it look like the netbook key that was entered is a 3 user key,as it says I have 2 activations remaining. I think I may install a netbook edition on my 15 inch laptop in a week when my NIS 2009 regular edition runs out. Just wanted to post this in case anyone else has similar problem. Thanks for the very clear and informative feedback. Glad it is all sorted out. I'm sure that Norton will be checking out how the keys got mixed up like that. So far as I know the netbook version only comes with the 3 PC Key. I don't know of any reason not to use the netbook version on a more normal laptop -- if it extends the battery run time so much the better! Look forward to hearing more of your experience with the Netbook edition on a "normal" laptop. Split it off if you want to but then include laptop in the subject -- or you could keep it part of this thread and just modify the subject in the reply editor by adding "on normal laptop" ? I don't see a downside to that since it is still about Installing the Netbook version but others may differ.